With over millions of downloads, the Arena of Valor has been one of the most popular MOBA games. This MOBA or multiplayer online battle arena game was developed by Tencent. For a quick review, gamers must create their own team composing of five members and defeat their rival to rank up or get rewards. Some players may feel not satisfied with the small screen, so they are searching for the way to play on a bigger monitor. 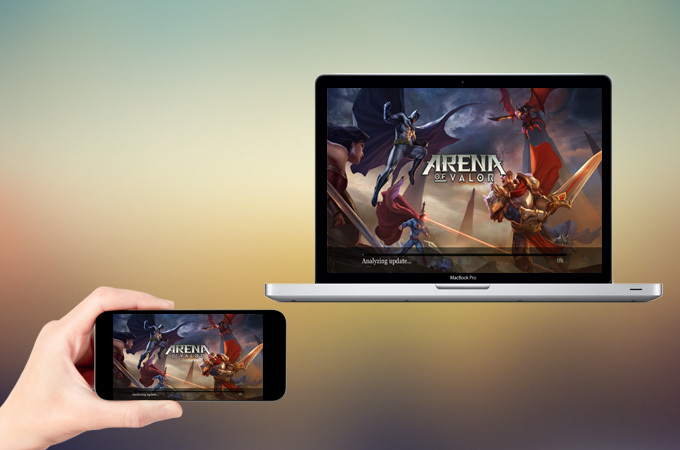 Following is the useful tools to display Arena of Valor on PC. The most practical way to play Android games on PC is by using ApowerMirror. This is a mirroring application that runs on Windows or Mac OS. It can stream Android or iOS devices to your computer. The program also features a control mode for Android which enables mouse and keyboard to control your device from PC. So, you can easily navigate through your battle as well as communicating with your teammates. 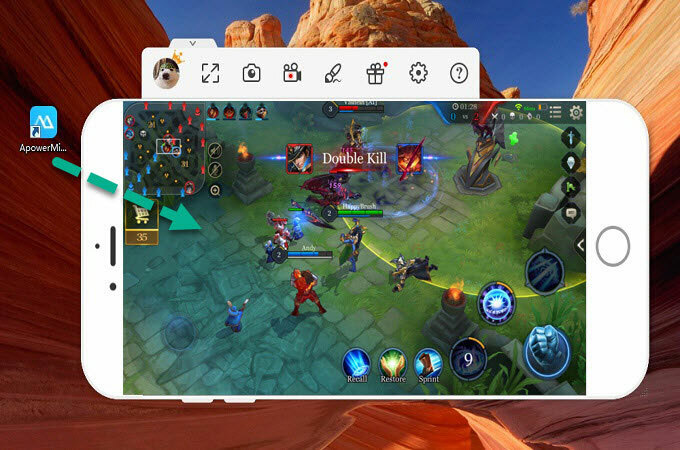 Here’s how you can mirror Arena of Valor to PC and play it smoothly. Click the button below to download ApowerMirror on your computer and install it. Launch the application on your computer then start connecting your device. Go to Settings > Developer Options > USB debugging and enable it. Simply plug your device to PC using an USB cable. Then choose the MTP mode. Once prompted with a notification regarding USB debugging mode, click on “Start Now” to start streaming your device. Connect your phone and PC to the same WiFi network. Open the “Control Center” on your iOS device. Tap “Screen Mirroring” and choose the device named “Apowersoft”. Within seconds, your iPhone screen will be reflected on computer. Open Arena of Valor on your mobile phone and start playing with your mouse and keyboard. Note: If it’s your first time to use the tool, to enable control mode from PC, please connect your Android to PC via a USB cable. Apart from its mirroring function, ApowerMirror also enables you to capture the performance of your device which is very helpful when you want to record a gameplay video. Furthermore, it has a whiteboard marker that can be used to put emphasis or draw lines and figures. 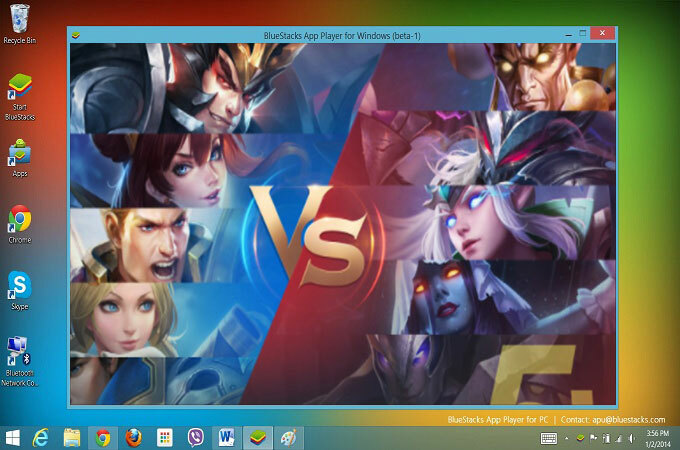 Another way on how to play Arena of Valor on PC is through an emulator- BlueStacks. Developed for Windows and Mac users, it has the ability to create a virtual Android device for free. This also offers premium version which costs $2 per month. The difference between these two is that the paid one provides more stable performance and quicker loading of gameplay. Just be wary of this because it might become laggy while you are playing games especially if you have low specs PC. Here is the method. To start, download BlueStacks on your computer and run the program. Next, follow the instructions within the app to setup your device. Once installed, go to My Apps > System Apps > Google Play Store. From there, find Arena of Valor and install it. After the installation comes to an end, the game will appear in My Apps tab of BlueStacks and All Apps tab of BlueStacks, you can now launch the game. Nox App Player is also an emulator that enables users to make an Android device of their choice on computer. It supports both windows and Mac OS. With this, you can download and install apps and games like Messenger, Facebook, Candy Crush, and obviously, Arena of Valor. The tool is based on Android 4.4.2 version and is designed like the typical Android. So, you won’t get lost while you are using this. 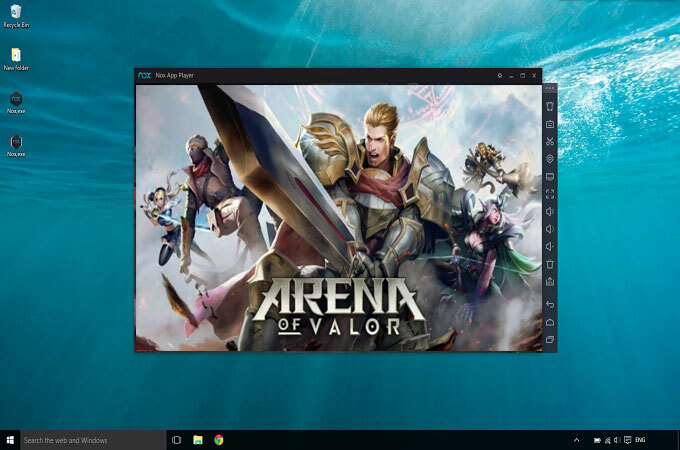 Begin to play Arena of Valor on the computer by installing the Nox App Player on your computer. After installing, configure your device and launch the emulator. When you run Nox for the first time, you will need to sign in with your Google ID. Click on “My Apps” > “System Apps” > “Google Play Store”. Search “Arena of Valor” and install it on Nox. However, its default launcher displays ads in the most annoying way. And, it sends your usage data to servers on other country which sometimes causes breaching of confidential information. The above applications show you different ways to play Arena of Valor on PC. If you don’t want to lose your data and start over again, it is suggestible that you use the first way which is ApowerMirror. This retains your gameplay progress and allows Android users to wisely manage your device with keyboard and mouse. Moreover, it does not affect your computer performance and allows you to record games without limit.